Style, class and seaside getaways are captured in this stunning canvas tote! It is perfect for a lunch date at a beach restaurant, for a shopping spree or a day out at the lake. Mix and match and use it whenever you can. This sophisticated look is ideal for any season with its deep nautical colors of sea-greens and blues. The wine red trims add depth and compliment the large anchor that takes center stage. Twisted ship's ropes complete the age-old nautical scene, a theme that always charms those with a sense of style. 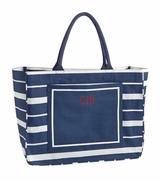 Nautical canvas boat tote measures 20"W x 15"H x 8" across bottom. Inside has zip wall pocket, supported bottom, stylish canvas handles and zipper closure.